The arched shape of the AttenuTech® Curved Banana Transfer Board enables a variety of positioning options but allows for the natural sweeping motion of an assisted transfer. 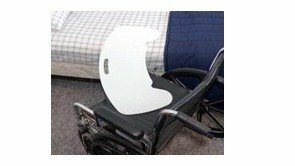 The Curved Banana Transfer Board is ideal for bed, car, wheelchair, and toileting transfers. The Curved Banana Transfer Board is made from durable, semi-rigid polyethylene that can be easily wiped down for cleaning and infection control. The top of the board is a smooth sliding surface and the ends are flared to provide a stable transfer platform. The Curved Banana Transfer Board can be used for both assisted and unassisted transfers. The MTS Medical Supply AttenuTech® Curved Transfer Board helps the patient transfer between surfaces of similar or slightly different heights. If you have decreased upper body strength, work with a caregiver to help you transfer. Using the industry standard of “a third, a third, a third”, place one third of the board on the surface you are transferring from, place another third onto the surface you are transferring to, and the remaining third is the space in between the two transfer points. Support your body weight on the flat surface as you move slowly and carefully paying attention to your movement and the location of your body as you transfer across the board. Don’t drag your buttocks on the board. Keep your body in the correct position keeping your feet flat on the floor throughout most types of transfers. When transferring, never put your hands or fingers under the board. When using the Curved Banana Transfer Board, it is recommeded that both the individual to be transferred and the caregiver wear a AttenuTech® Transfer Belt to provide an extra margin of safety and control during the transfer. Weight capacity 250 lbs. Made in the USA.